Is there no area of paid human endeavor unthreatened by robots? How about sketching? The more advanced creation is e-David. A machine built with an arm from an industrial robot, e-David is capable of grasping five different brushes and can dip each brush into a paint container, allowing for the use of up to 24 different colors in each painting. 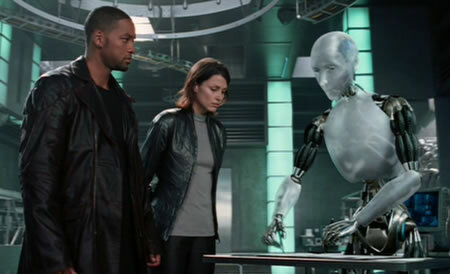 Maybe not quite a prediction, but SF fans were treated to robotically produced art in the 2003 movie I, Robot, when Sonny rapidly (!) sketched a picture of his dream about a bridge.